Free to Be Me: Remember Me! We all have people in our pasts who have impacted our lives greatly and whose influence has left ripples for generations to come! I got to join my husband recently as he spent time with just such a someone! Tim has often shared stories with the kids and me of his days playing Little League, college and professional baseball. As you can well imagine, the years were filled with many coaches and some were more memorable than others. One coach whom Tim has always referred to as an influencer and a man from whom he learned a lot is Chase Riddle! It has been said that Chase Riddle has forgotten more baseball than many men ever knew in the first place! To say that he loves the game of baseball is an understatement. Coach Riddle himself played professional baseball and he coached and scouted at the professional level. By the time he entered Tim's world, he was coaching at Troy State University in Troy, AL where Tim went to pursue his dream of playing pro ball! Coach's sun-weathered skin hinted at the Indian blood that coursed through his veins and the stains on his jersey were evidence that he had long ago embraced chewing tobacco as a viable pastime! Coach Riddle taught his players to be smart when they played! He taught them with integrity and wisdom and a lot of passion thrown in! Coach taught his players a lot about baseball, but he taught them about life as well. He taught in such a way that he would endear himself to his players and they would be drawn back whenever the opportunity presented itself! On the way back from a Florida vacation, our family had the opportunity to spend an hour with Coach and Mrs. Betty. It was a special time of rekindling old friendships and forging new ones. It was a chance for our children to glimpse back into their Daddy's past and see someone who helped shape him into the man he is today. Baseball stories abounded and there were more than a few laughs! As we prepared to leave, Coach walked out to the car with us. It meant a lot, for he was still recouping from surgery a few weeks ago and even a short walk like that was sure to be tiring. He and Tim embraced one last time and Tim got in the car. No sooner had the door closed, than Coach was knocking on the window. He apparently had one last thing to say, and he had saved the best for last! Coach Riddle, the one who had spoken life into the lives of so many, had a final admonition. He leaned into the car and with an urgent tone, gave Tim one last charge..."I see how close your family is and how much they mean to you! Hold them close and don't ever allow anything to become more important than the time you spend with them ~ not baseball or ministry!" Thank you Coach and Mrs. Betty! Thank you for allowing us to spend time with you in your home and thank you for continuing to be influencers of others. Thank you for making relationships paramount to everything else and encouraging others to do the same! You have left your mark and we are forever grateful! I was deeply moved by your opening quote, even before I got to the telling of the story! 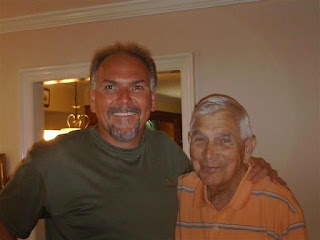 I'm so glad you were able to spend this time with Coach; to connect the dots for your kids and give them a deeper understanding of the events and people who have helped shape their parents' lives. Don't you just love that quote?! I spent much of yesterday searching for the right one and when I read that, I knew it was perfect! Agreeing with Nikki on the quote, I was weepy before I even got to the real story! What a beautiful reunion and wonderful glimpse into Tim's life for the rest of you! As I read the beginning comment I thought about meeting you at the FIAR conference and how then and many times since you have made an impact on my life. Thank you for sharing this precious time! Ah, Darla, I think of you often and am so thankful for your friendship! Thanks for the encouragement!!! Wow Barb your whole post literally gave me the chills! Loved the opening quote and how you wrote the story! And so cool on the last words from the coach...he sounds like one amazing man! Thank you for sharing! I didn't even know you had a blog and am now so glad I can have you bookmarked! Of course I guess I never looked really hard as I could have seen that on your profile on fiar but some things just pass me by! Hope you are having a great day!